It is going to be difficult to keep this review objective as Ian Svenonius’ emissions and incarnations have had a massive influence on your humble narrator during his formative years. His first band, Nation of Ulysses (and Cupid Car Club later on) was one of the many great, innovative bands from the ever creatively fertile grounds that is the Dischord family and the context of Washington, DC at large. Iconoclastic in its ways, Ulysses shook up dusty punk rock standards and its stale clichéd rituals by drawing on the energy of 60ies soul performances and infusing their live shows with physicality. The Make Up rose from Ulysses’ ashes to create an altar to gospel, soul and garage rock’n roll and what the French refer to as yé-yé music: The delightful strand of pop music that influenced France and beyond with its particular camp style throughout the 1960ies. If you are ever interested in learning where Refused’s Dennis Lyxzen got his moves from and the inspiration for framing “The shape of punk to come” in a socio-political context (and basically the template for The (International) Noise Conspiracy, including fashion style), you might want to check out The Make Up or pretty much any of Svenonius’ projects. There is something to be said for the fact that even the epigones that channeled Svenonius’ swag became at times even more successful than its originator. 2017 – enter Chain and the Gang! Devoid of unnecessary ideological weight, “Chain”, i.e. Ian, and his “Gang” of three ladies focus on the essence of, hmm, gospel-funk with a big punk heart and the aura of 50s / 60s vocal quartets? Chain and his Gang call it “crime rock”. Ian is radiating with charisma and in the flesh executes a rare mélange combining seemingly oxymoronic self-awareness of a host and free-form stream of consciousness performer. It is not too difficult to see shades of a range of great performers in his on stage antics, e.g. Iggy Pop, Nick Cave and pretty much everyone who managed to convincingly shake his hips to 60ies Motown greats. Chain and the Gang is a fantastic live band. With their matching suits they look like a mod-soul band and present themselves accordingly. They channel sing-songy tunes, surf guitars, vaudevillian call-and-response, Ray Charles, the grit of garage rock with alluring female back-up vocals. 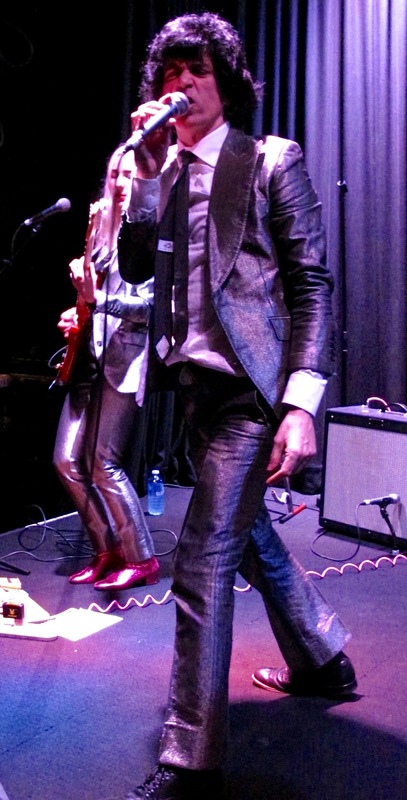 Chain and The Gang is another one of Svenonius’ subversive endeavours, i.e. tongue firmly placed in cheek and subtly critiquing conventions and standards of “pop and rock music” while at the same time reveling in its essence and having a great time doing it. The concept behind Chain and the Gang is based on carbohydrates more than protein, i.e. less heavy on ideology and less trying to reinvent the wheel and instead focusing on the groove, charm and personality. Chain’s subversion is its anti-innovative approach. You dig? Sounds like a great time to experience and check out Chain and his Gang?